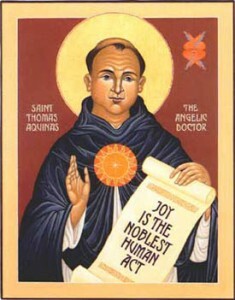 The study and teaching of St Thomas Aquinas have been a priceless gift to the Church. Born in Naples in 1225, Thomas was a son of Italian nobility. While a student at the University of Naples, Thomas met the Dominican Friars and received the habit. Thomas’ family, preferring him to have the powerful position of abbot of the Benedictine Abbey of Monte Cassino, rather than the life of a begging friar in a humble new order, kidnapped and imprisoned him until he would change his mind. After a year’s imprisonment, Thomas escaped with the help of his sisters and returned to the Dominicans. Following a period of formation and study at Cologne and Paris under the tutelage of St Albert the Great, Thomas began his life’s work of teaching and writing. He taught at universities and Dominican houses in Paris, Rome and Naples. His written works include commentaries on the Sacred Scriptures and the works of Aristotle, the Summa Contra Gentiles and his best known work, the Summa Theologica (a work giving the theological foundation of the truths of the Catholic faith). A gentle humble man, St Thomas had a deep devotion to the Cross of Christ. He said that he had learned more from the crucifix than any book. He began all his works in prayer at the foot of the cross. His love for Christ in the Eucharist is apparent in the hymns and prayer he composed for the liturgy for the Feast of Corpus Christi. The best known of these hymns include O Salutaris Hostia, Tantum Ergo Sacramentum and Panis Angelicus. In his brief life, he was only fifty years old when he died, St Thomas left a treasury of wisdom and learning for the Church. The Church has honoured him with the title Angelic Doctor. Both the Council of Trent and the Second Vatican Council relied on and explicitly mentioned his works, especially the Summa Theologica.